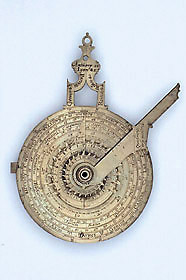 This instrument illustrates the skills of the Flemish school of instrument makers of the 16th century, among whom one of the most noted engravers was Michiel Coignet. Coignet was a mathematician working in Antwerp, but the style and content of his work are related to the slightly earlier workshop of Gualterus Arsenius at Louvain. Here he combines the nocturnal and an unusual form of altitude sundial to produce an instrument for telling the time either during the night or during the day.